Originally published in AudioMedia Magazine, November 1991. New: read comments on this article in the form of a dialog between Richard Elen and noted electronic music composer/performer Wendy Carlos, by kind permission of s2n magazine. The Ambisonic surround sound system was developed in Britain during the 1970s, hard on the heels of the so-called 'quadraphonic' techniques--and became tarred with the same brush. For a number of reasons, more political than technical, it has up to now only received limited acceptance in the consumer and professional audio market places. But now all that is changing. Major interest from Japanese hi-fi manufacturers, and the current interest in encode-only stereo enhancement are bringing the system back into the limelight. But according to Richard Elen who has been working with the system for over 15 years, it never went away. "In nature, sounds come from all around our ears. Reproduced sounds come from only a few loudspeakers. Directional distortion results whenever our ears can hear the difference. As other distortions in the audio chain have been progressively lessened, so directional distortion has become more noticeable. "The earliest widely used attempt to mitigate directional distortion is stereo, which however gives a directional illusion only over a frontal sound stage. The Ambisonic technology is the culmination of over two decades of systematic research into how directional distortion can be reduced as much as possible using any given number of audio channels and loudspeakers. "Just as the accurate reproduction of performed music is the crucial test of audio fidelity, so the ability to reproduce correctly the directionality of natural sounds is the crucial test of a surround sound system. Unless it can do this, there will not be the correct disposition of indirect sound which provides the acoustic ambience of the performance and gives the position-dependent labelling of direct sounds by their wall reflections, which is an important aspect of the appreciation of music. "If a system can cope with this difficult task, it should go without saying that it can easily deal with the relatively simple problems of synthetic source material. A system of surround sound which is able to reproduce the directionality of indirect reverberant sounds, as well as of direct sources, is termed 'Ambisonic'"
Ambisonics was the brainchild of a small group of British academics, notably Michael Gerzon of the Mathematical Institute in Oxford, and Professor P B Fellgett of the University of Reading. From the beginning, it was designed as a surround sound system that would overcome the major problems of the so-called 'quadraphonic' systems that were its predecessors -- the main one being that they simply didn't work very well. Research rapidly indicated, however, that in addition to providing full surround sound in an encode/decode environment (where the original recording is encoded into a stereo/mono-compatible form for transmission and later decoded by the listener into multiple speaker feeds), Ambisonics could also offer a significant 'super stereo' capability without decoding. With current interest in single-ended stereo enhancement techniques like RSS and QSound [see Audio Media April and Aug/Sept 1991 respectively], it's interesting to note that Ambisonic processing equipment has been used as a single-ended stereo enhancement device by radio stations, now especially AM stereo stations in the States, for almost a decade. Ambisonics built on the astonishing work on stereo recording and reproduction performed by Britain's early audio genius, Alan Dower Blumlein. Blumlein was working on stereo recording and disc-cutting in the Twenties, and as well as developing the stereo cutting system introduced over 30 years later for microgroove stereo LPs, he also invented what is at once the simplest and most accurate of all stereo recording systems: M-S coincident pair recording. At a time when Bell Laboratories in the States were also investigating stereo, but with omnidirectional spaced microphones (which left a hole in the middle that required a third, centre channel to fill it in - a precursor of Dolby surround? ), Blumlein realised that there was more to the ear/brain combination's ability to position sound source in space than merely the difference in level between the ears. The principle is easily illustrated by considering a conventional mixing console panpot being used to pan a mono signal between two speakers -- an illustration that indicates, too, how little Blumlein's work is now remembered in the audio industry. Something we often forget when we mix a multitrack tape to 'stereo' is that what we're doing really represents the spatial localisation of sound sources very poorly. Where we place a track in the space between the speakers is purely a matter of which speaker is louder than the other--that's what a panpot does. Just imagine that you're listening to a sound that's centre-stage. It has equal levels on both channels, and your meters will read identical values. But now move to the left and what happens? The sound follows you to the left, because now there's more energy reaching you from the left than the right. That's the main drawback of this system--because it's not 'stereo' at all: it's 'panpotted mono'. Send all the signal to the left speaker and it comes from the left. Send equal levels to both speakers and it's in the middle--or is it? The standard stereo listening position, with the speakers at 60 degrees to each other. Further apart than this and stereo begins to develop a 'hole in the middle.' Normal panpots operate with level only, so the listener in this example hears the sound coming from the left, because there is more level arriving from the left-hand speaker. Now the panpot is central, but the listener has moved to the left. The sound still appears to be coming from the left, because there is still more level arriving from the left-hand speaker. When we listen to sounds in real life, they don't behave like that. The reason is that level between our two ears is just one of the methods we use to localise sound sources in space. There are two others--phase and the 'Haas Effect'. Some researchers think that they're at least as important as level. If a sound is off to one side, we still hear it with both ears, but there is a difference between the signals arriving at the two ears. Apart from differences in level (and high frequency content for that matter), there's another factor: phase. The wavefronts from the sound source don't reach the ears at exactly the same time, and we interpret that phase difference as localisation information. It's a very impressive effect if you try it yourself in the studio. Switch your monitoring into mono while you do this, by the way, and you'll hear a familiar sound--the 'swooshing' effect of true 'tape phasing' or 'flanging'. This was how, using tape machine record-play head delays instead of DDLs, George Chkiantz at Olympic Studios produced the original sound of 'phasing' on the Small Faces hit, Itchycoo Park--possibly its first controlled use (the effect had been used on the soundtrack of a Fifties movie, The Big Hurt, but this was done by running two identical copies of a piece of music together and changing the speed of one of them to bring it into sync--a rather haphazard way of creating the effect). Setup for phase-shift panning. Use this in mono to obtain flanging. The third method of spatial localisation used by the ear/brain combination is called the Haas Effect, after the man who discovered it. The theory is simple: if we hear a sound directly, but we also hear it at the same time indirectly, say bouncing off a wall, two signals arrive at the ears. The direct sound arrives first, but the reflected sound turns up just a little later. The brain rightly interprets that second arrival as a reflection and doesn't confuse it with the true direction of the sound. We're talking here of significant delays in the order of tens of milliseconds. Exactly what delay you can hear will vary between people--try it with the same setup as that described above, but set the delays to different values and listen without twiddling at the same time--but you will notice how the delay is ignored as a localisation cue when it becomes longer than a certain amount. This is why, if you ADT a sound and split it hard left and right in a mix (a useful production technique), you have to increase the level of the delayed sound to make it appear equally balanced with the direct sound on the other channel: the extra level is needed to fool the brain into thinking that the delayed sound is something different with its own localisation. Taking a signal, splitting it and delaying one path, then positioning the two signals hard left and hard right gives a useful effect. However, for the level on both sides to sound the same, the delayed channel must be louder to overcome Haas Effect, which is trying to tell you that the delayed sound is just an echo. 'Stereo', in the sense of two transducers picking up signals from two points close to each other, had been demonstrated as early as 1881, when Clement Ader had relayed music from the Paris Opera via phone lines to the Paris International Exhibition of Electricity (see Tony Askew's 'The Amazing Clement Ader', Studio Sound, September 1981, p.44). But this was nearer to 'two channel mono' than true stereo. Blumlein's approach, on the other hand, utilised a pair of microphones at the same point -- a coincident pair. One mic was an omnidirectional type, and thus picked up everything--in stereo terms, it picked up left plus right (L+R). At right angles to it, but as physically close to the omni as possible, was a second microphone, with a figure-of-eight response, pointing to the left. A figure-of-eight polar diagram means that sound waves hitting one side cause a positive displacement with respect to the other side, and so the signal picked up is actually the difference between left and right (L-R). The Blumlein coincident pair--an omni mic crossed with a figure-of-eight pointing left. You'll notice that this 'stereo' is a bit odd. Instead of a left channel and a right channel, you have a 'sum' and a 'difference' channel. You can't listen to them directly: they have to be decoded into the more usual left and right channels. This is done by a simple matrix. The sum of the two channels gives you (L+R) + (L-R) = 2L --the left channel. Meanwhile, subtract one signal from the other (or simply mix them together, reversing the polarity of the difference signal) and you get (L+R) - (L-R) = 2R --the right channel. Interestingly, you can simulate this effect without using a sum-and-difference technique. Just take two microphones with cardioid polar diagram and cross their capsules horizontally at 90 degrees. The effect is virtually identical to Blumlein's technique, and needs no matrix decoding. Coincident-pair stereo is a remarkable technique. It is perhaps the simplest microphone technique that approaches our own hearing in its ability to reproduce spatial information. On speakers at a true 60 degrees to each other (as stereo speakers are meant to be) the sound has remarkable depth--it isn't just a straight line between the speakers--and the image is also incredibly stable, sounding more or less the same wherever you are between the speakers, unlike panpotted mono. On headphones you can actually seem to hear things behind you and, occasionally, even above you. This is not as unlikely as it sounds-- do we need ears in the back of our head to hear things going on behind us? No, the front-back asymmetry of our ears changes the characteristics of sounds heard from behind us as compared to those in front. Ambisonics is simply Blumlein's stereo system, extended into three dimensions. Three? Yes, Ambisonics is capable of encoding sound sources from any direction in space, including vertically. The technique employed in an Ambisonic microphone is to use the equivalent of a single omnidirectional capsule plus three figure-of-eight capsules: one pointing left-right, one front-back, and the other up-down. In most Ambisonic microphones, such as the Calrec Soundfield mic and its successors, these four polar diagrams are simulated by a tetrahedral array of capsules. This has the benefit of also allowing them to be electronically corrected for true coincidence -- because the closer together the capsules are, the more accurate the localisation is, particularly at high frequency. This is one of the reasons that the Soundfield microphones are excellent M-S stereo mics as well as having their (somewhat under-exploited) surround sound benefits. A soundfield microphone is just that--a device for capturing all the sounds in an environment so that they can be stored in such a way as to make it possible to regenerate in the listening environment the original pattern of sound waves falling on the microphone. The Soundfield Mic--an omni crossed with three figure-of-eights at right-angles. Soon after the development of the Soundfield microphone, developments began to be made in the field of simulating soundfields as well as simply capturing them. The result is that today there are comprehensive mixing systems that allow individual multitrack signals to be panpotted into an Ambisonic picture--an area we'll look at later in this article. If a 'traditional' Blumlein M-S coincident pair gives you two signals which need to be decoded to derive the left and right speaker feeds, it's fairly obvious that a three-dimensional Blumlein system will give you more of the same. In fact, the 'studio format' for Ambisonics, generally known as B-Format, is exactly this: a mono (sum) signal from the omnidirectional component (Left + Right + Front + Back + Up + Down), known as the 'W' component, plus three difference signals: Front - Back (known as the 'X' component), Left - Right (the 'Y' component), and Up - Down (the 'Z' component). Notice that only four channels are needed to encode not only surround information, but also height (Ambisonics with height is generally called 'Periphony'--"sound around the edge"). So why did the old 'Quad' systems need four channels to encode simple horizontal surround? So-called 'Quadraphony' was a rather unfortunate failed series of attempts to persuade people to buy twice as many amplifiers and loudspeakers. Produced in the early Seventies when the technology was really not up to it, the systems available offered various combinations of problems with, occasionally, some interesting effects. At the root of Quad's problems were several misconceptions. The idea was to reproduce a soundfield--which of course exists all around the listener--but the idea that this could be represented by recording four channels and replaying them through four speakers at 90 degrees to each other around the listener was simply incorrect. You can obtain some impressive effects, but in terms of accuracy, the results are disappointing. One reason is that stereo simply does not work with speakers at 90 degrees-- you get holes between them. At the root of Quad was the idea of using panpotted mono in two dimensions with four channels, and some of the (so-called 'Discrete' or '4-4-4') systems did no more than this: utilising sum and difference systems in the same way as they are used in FM stereo--with subcarriers on vinyl discs! --to get the mono compatible sum signals in the normal groove and the difference signals modulated on subcarriers. The listener without a decoder simply heard the baseband signals--Left Front plus Left Rear on one side and Right Front plus Right Rear on the other--and missed out on the difference signals encoded on the high frequency subcarriers. To offer stereo compatibility without subcarriers, many of the several systems available attempted to matrix the original four 'Discrete' channels down to two, using phase relationships to encode the surround positions, and then somehow recover the original four signals in the decoding process. These systems were often referred to as '4-2-4' systems--four original signals, matrixed into two transmission channels, and then decoded into the original four again. Unfortunately, this is mathematically impossible, and '4-2-2.5' would have been a better name for them. Instead of a sound panned around the room in a circle actually going around the room in a circle, it would do something else. In one case it went around a shallow ellipse, with little front-back definition. In another the front stage was fine but the rear was a very odd shape, with centre-rear being in the centre of the listening area. The spatial inaccuracies of the quad systems was one of their major shortcomings as these attempts to pan a sound in a circle indlcate. Only UD-4 got close. The solution to poor localisation was a system called 'logic decoding'. The principle here was that if there was, say, one sound source playing, the system could work out where it was supposed to be and turn the other speakers down. That's fine as long as there's only one thing going on. Of course, there seldom is. The original Quad systems died out, but two developments of them were left behind. One was Dolby Surround, which is now widely used in the film industry. It owes a lot to two of the commonest Quadraphonic systems, CBS's SQ and Sansui's QS systems. As its heritage might suggest, it is excellent for impressive sound effects and ambience but is not highly accurate in its representations of localisation (it is not intended to be), and it is sometimes quite difficult to work with--logic decoding means that when several widely-spaced sounds are present, the sound stage tends to collapse as the logic decoding is rendered less effective by the multiple sources. Not everything that came out of Quad developments was flawed, however. One subcarrier system--developed by Nippon Columbia and called UD-4 (the 'UD' standing for 'Universal Discrete') -- successfully recreated a circular locus in the listening environment. As a Quad system, however, it was limited in its success. The big challenge for Ambisonics was how to get the four sum-and-difference signal components into a form that was stereo- and mono-compatible, so that the system was able to interface successfully with existing systems. This was the challenge that Quad had failed, both with the expense and difficulty of subcarrier systems--with their special styli and loss of subcarrier information due to record wear--and with the inability of matrix systems to recover all the surround information successfully. The answer was a phase encoding matrix that brought together work carried out by the Ambisonic team, the BBC, and some of the original designers of the UD-4 system. The Ambisonic team had developed a matrix called '45J', and the BBC were doing test transmissions with 'Matrix H'. Adding a dash of UD-4, the UHJ system was born. UHJ is a unique hierarchical system of encoding and decoding directional sound information within the Ambisonics technology. Depending on the number of channels available, the system can carry more or less information--but at all times, UHJ is fully stereo- and mono-compatible. In its most basic form, 2-channel UHJ, horizontal (or 'planar') surround information can be carried by normal stereo signal channels--CD, DAT, FM radio, or whatever. Summing the two channels gives a highly compatible mono signal which in fact is a more accurate representation of the two-channel version than summing a conventional 'panpotted mono' source. If a third channel is available, this can be used to give improved localisation accuracy to the planar surround effect. The third channel does not have to have full audio bandwidth for this purpose, leading to the possibility of so-called '2.5-channel' systems. The third channel can be broadcast via FM radio, for example, by means of phase-quadrature modulation. Adding a fourth channel to the UHJ system allows the encoding of full surround sound with height, known as Periphony. The theoretical path from B-format to the various stereo/mono-compatible UHJ variants. In fact many mixing applications will go straight from multitrack to 2-channel UHJ at present. A fundamental consideration at the very beginning of Ambisonic development was the question of the listening environment. Ambisonics was originally envisaged as a system in which the home listening room acoustic could be 'overlaid' by an image of the original soundfield captured at a live performance--typically a classical concert. One of the other problems of Quadraphonics, with its four speakers at 90 degrees to each other, was that the layout had to be exactly square, and the listener had to sit at the dead centre of the square. Most readers, I am sure, have visited numerous friends who keep their stereo loudspeakers in some very odd places--one channel behind the sofa and the other on top of the bookcase, for example. It's hard enough to get people to put two speakers in sensible places for stereo--what about four for surround sound? The solution was to design the Ambisonic decoder in such a way that rather than each speaker receiving a single channel feed destined for it from the beginning, as in Quad--where you had to place the speakers at home in the same relative positions as they had been in the studio control room--you instead positioned the speakers in 'sensible' places, then told the decoder where they were. The 'layout control' on an Ambisonic decoder, therefore, causes the decoder to output the correct speaker feeds for the speaker positions you would like (or are obliged to have). One result of this feature is that you can have your front speakers in a normal stereo position. An extension of this principle is the ability to design Ambisonic decoders for any number of speakers. Four is the minimum for planar surround, and six for periphony, but in a large environment such as a cinema, it may be a good idea to have a dozen speakers or more. There is no theoretical limit to the number of speakers. Similarly, there are few limits to speaker positions, either. Your four speakers at home or in the control room can be placed in any rectangle, wide or narrow, as long as the ratio of the sides doesn't exceed 2:1. And because Ambisonics tries to recreate the original soundfield, speakers tend to work together and thus smaller speakers are often more effective for Ambisonic replay--they give more accurate localisation across the frequency range because the drivers are closer together, and they tend to exhibit better bass response than when the same speakers are used in stereo. A typical monitoring setup in a control room, therefore, is to use the main speakers for checking the stereo and four nearfield monitors connected to a decoder for Ambisonic monitoring. Most decoders have a bypass facility too, which enables the input signal to be monitored on the front pair of speakers only, so stereo and mono nearfield monitoring can also be carried out. If Ambisonics is so wonderful, how come we aren't all using it? The answer is a sad tale of bad luck and politics. The original University-based inventors of Ambisonics were in no position financially to develop the idea commercially. Luckily, there was an organisation that was established to do exactly this: to help University inventions get out into the wide world of industry and commerce. The National Research Development Corporation had achieved some notable successes in this kind of activity, and the fledgling Ambisonics was presented to them. They were interested. The NRDC approach consisted of obtaining and administering the patents associated with an invention, funding its development, and then finding a licensee for the invention. The inventors would then earn a royalty from the invention and the NRDC would recoup its investment. That was the theory, and it worked quite well in some areas. The NRDC approach would particularly suit you if you had, for example, developed a new way of making some kind of plastic. The idea could be licensed exclusively to a chemical manufacturer, and off you go. For some other types of invention, however, the NRDC approach was disastrous--as the inventor of the Hovercraft would testify. In hindsight, some might propose that the NRDC was not the best organisation to handle Ambisonics. However, although a lot of things didn't happen, and a number of apparently ill-advised things did, it is difficult to see what other organisation would have got Ambisonics off the ground. The system may have languished for a decade or so, but it is quite possible that without the NRDC it wouldn't be here at all. The problem was that while the NRDC was set up perfectly to license an invention to one exclusive licensee--ideal with that chemical process, for example--it was not in the slightest bit in a position to promote a system whose success rested on as many companies as possible becoming licensees. We can imagine that it would have failed equally with an invention like Compact Disc, DAT, Dolby B, or even the humble Compact Cassette. While the NRDC had the funding to go around selling ideas to individual companies, the idea of mass marketing an invention like Ambisonics --holding big press conferences, exhibiting at trade shows, making demonstration records, and generally selling one thing to a lot of people-- was out of the question. Ambisonics needed something more like product marketing and less like searching quietly for an exclusive licensee. It is even possible that the NRDC's brief simply didn't allow it to do the things that Ambisonics needed. One by one, however, companies began to pick up on the system: record companies like Nimbus--the longest and most consistent licensee, with literally hundreds of CDs produced over the last 25 years, every one Ambisonically recorded with their equivalent of a Soundfield microphone; hi-fi manufacturers; and professional audio manufacturers like Calrec, who produced the first Soundfield microphone. Ambisonics was originally designed to reproduce sonic actuality as accurately as possible--an approach exemplified by Nimbus Records, whose 'Natural Sound' is more an entire philosophy than simply a method of recording and playback: surround sound handled as accurately as possible is just one of the facets of the Nimbus approach. However, there were plenty of people who wanted to do decidedly unnatural things with the process, like mixing multitrack recordings Ambisonically. The idea of Ambisonic panpots had been included in the original theoretical work by Michael Gerzon, but it wasn't until the early 1980s that practical pieces of studio equipment began to emerge--from Audio & Design Recording--which enabled conventional multitrack recordings to be mixed into an Ambisonic format. These units (now licensed to Cepiar) were--and still are--very cost-effective, and several major artists began to use them, but in the meantime, apart from Nimbus, very little was happening. A chicken-and-egg situation developed during the Seventies and early Eighties in which hardware manufacturers looked at Ambisonics but put their projects on hold due to lack of software--they were looking for more than a series of classical CDs, however good they were. Boots Audio, for example, were poised to launch a complete Ambisonic microsystem-- but changed their minds. Meanwhile, many people on the record side were unwilling to make Ambisonic recordings because nobody could decode them. This situation should never have arisen, and it could have been short-circuited by two things, had they been better known. The first was that Ambisonically-recorded albums sounded a lot better than regular stereo, even if you didn't have a decoder. For example, Digital Audio magazine in 1986 reviewed one of the first mainstream Ambisonically-mixed CDs-- Stereotomy, by Alan Parsons--with comments like, "Studio pop production doesn't get any better... a winner in the sound quality stakes. Sounds emerge from everywhere, clear and clean. The opening of track 3... completely fooled my dog into thinking a car had driven up the driveway. The only track in which Ambisonics was not used... [was at] lower volume, more distant." It was worth making Ambisonic records, even if nobody ever decoded them. 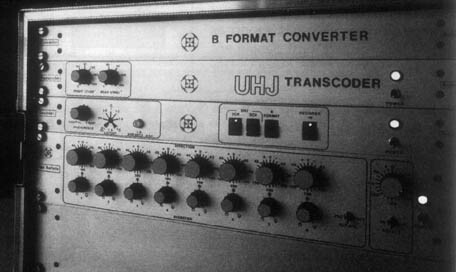 And secondly, as manufacturers like Minim and Troy Ambisonic (a maker of in-car Ambisonic systems) quickly discovered, decoders could offer a 'super stereo' mode which would dramatically enhance existing stereo recordings played through the decoder, by extracting surround information and using it to create impressive localisation and 'wrap around' effects. And the strategy of trying to persuade record companies to endorse Ambisonics and use it on all their albums--a similar approach to that used by the failed Quad systems--really put the companies off. Anything that smacks of double inventory is likely to do that. And besides, not only was there no need to ask record companies to commit to Ambisonics; you didn't need to ask them at all, any more than if you wanted to use a particular make of digital reverb on your album. The decision was made in the studio by the producer, not by someone at the record company. It was only very late in the day that direct approaches began to be made to producers and studio personnel, and then NRDC fell foul of the next problem -- the government that created it. It's a known fact that Margaret Thatcher's government really didn't like the idea of the NRDC. Their view was that British inventions should stand or fall on their ability to attract industry backing on their own, and that a "quango" -- a quasi non-governmental organisation -- shouldn't do it for them. But rather than admit this, the course taken was to restrict the NRDC and prevent it doing its job properly, so as to demonstrate how such organisations were a Bad Thing--a technique which was also attempted with the British Health Service. The NRDC was bound together with the National Enterprise Board--who at the time used most of their budget to fund British Leyland--to form a fictitious entity called the 'British Technology Group'. Not too long after this, despite highly competent NRDC people in charge of the Ambisonic project--as was the case all along, it is important to point out-- virtually everything that was being done, stopped being done. At the time, a member of staff privately suggested to me that one of the main problems was that nobody knew how much funding they'd have next month, so the idea of planning anything like a long-term marketing plan for Ambisonics was completely out of the question. The system became moribund, with a few exceptions: Nimbus Records; a few other enterprising record companies like Brendan Hearne's York Ambisonic; parts of the BBC quietly doing drama and concert recordings with Soundfield mics; EMI Music's KPM Production Music Library; and manufacturers like Calrec, Audio & Design, and Minim. Eventually, the NRDC saw a way out of the situation, simply by doing what they were best at--namely locating a single, exclusive licensee and letting them take responsibility for 'doing something' with the mass of Ambisonic technology, which by now included nearly 400 patents. Very soon there were three contenders for the privilege: Nimbus Records, Avesco plc, and a Canadian group called Maple Technology. To the likes of you and me, Nimbus, with two decades' experience of the system, were number one contenders; and Avesco, a major British technology-based group with interests in high technology audio and video, were second. None of us knew anything about Maple, so it was a great surprise when they were awarded the licence. Then everything went quiet again--for months. Absolutely nothing happened and eventually the licence was terminated. Next, Avesco got it--and also proceeded to sit on the technology for months. They disposed of their Troy Ambisonic subsidiary (a condition of obtaining the licence, apparently!). After a long period of inactivity, they too lost the licence. Finally, the exclusive licence to Ambisonics passed to Nimbus Records. One of the first activities of then Company Secretary Stuart Garman--an avid music enthusiast and long-term supporter of Ambisonics--was to present the system to major Japanese manufacturers looking for a way to offer new, serious surround sound capabilities in their products. A UHJ decoder will handle Dolby Surround-encoded material very impressively, interestingly enough, (it is also possible to convert Dolby Surround material to UHJ) and UHJ itself is an ideal audio format for future TV and disc formats and Digital Audio Broadcasting. And a built-in 'super stereo' processing mode ensures that any stereo recording will sound impressive, UHJ encoded or not. Meanwhile, on the software front, Collins Classics, at the time an increasingly important classical label, announced their intention to record all their albums Ambisonically--not in the Nimbus way with a single microphone array, but using multitrack digital recorders and Ambisonic mixing equipment. The announcement followed a series of experiments with the technology, including recordings of Vaughan Williams symphonies with Sir Neville Marriner. Ambisonics, at last, was getting the attention it deserved. Applications for Ambisonics fall into three main categories: natural sound recording with a single Soundfield-type microphone; mixdown of conventional multitrack recordings; and stereo spatial enhancement. There are also combinations of these categories--for example, a multitrack recording might well use a Soundfield mic, and any Ambisonic recording will exhibit spatial enhancement effects. The technique here is simply to use a 'Soundfield' type microphone and appropriate encoder. Several types of microphone are available, notably the AMS-Calrec Soundfield mic and its Soundfield Research successors, and it is even possible to create one with discrete microphone units-- Dr Jonathan Halliday, resident technical genius at Nimbus, created a planar Ambisonic microphone with a combination of Schoeps and B&K mics with a custom encoder. The Soundfield microphone control unit includes a B-Format output and this can be recorded on a 4-track recorder for later modification, or encoded on the spot to 2-channel UHJ. Encoders are available from Minim Electronics (portable), AMS, and Audio & Design/Cepiar. Encoders often also offer transcoding facilities (see below). The microphone can be placed anywhere you would position a good stereo microphone--in other words, somewhere that sounds good. The microphone control units generally allow some degree of manipulation so as to correct inadvertent rotation of the mic while suspending it, for example, or a device like the Pan-Rotate unit can be employed (see below). The results are excellent. Multitrack recordings can be mixed to UHJ in a number of ways, depending on the sophistication of the recording and exactly what you want to be able to do. The simplest method is to use a Transcoder. The Transcoder--such as that originally manufactured by Audio & Design and now available from Cepiar-- takes two pairs of stereo signals in, and gives a UHJ 2-channel signal out. As transcoding also uses part of the encoding process used in converting B-Format to UHJ, many encoders often offer transcoding facilities. The front panel controls are simple: width controls for front and rear stages, and a power switch. Typically, two console stereo groups are designated front and rear and fed into the front and rear stereo inputs of the device. The position of a sound source in the stereo soundstage is transcoded into an equivalent position in the Ambisonic picture. So, for example, if a track is panned hard left in the front stage--corresponding to 60 degrees left of centre front in stereo--this will be transcoded to the left edge of the front stage in the Ambisonic soundfield. The width of the input soundstages can be varied between 0 and 180 degrees for the front and 0 to 150 degrees for the rear (localisation is not as stable beyond 150 degrees at the rear) This means that the front stage can cover up to the whole front half of the Ambisonic circle and the rear stage cover almost all of the back. The Transcoder can also be used to convert existing discrete Quad 4-track recordings to UHJ, by setting the stage widths to 90 degrees. A more accurate, but seldom used, unit is the B-Format Converter. This enables standard console panpots to be used to generate B-Format signals. These can then be fed into a B-Format input on a Pan-Rotate unit or straight into a Transcoder. The Converter is designed to operate with constant-power console panpots but it operates entirely satisfactorily with the compromise between constant-power and constant-voltage now generally found on mixing consoles. An auxiliary send is derived postfade and set to the same level as the fader output. This can be done by measurement or by ear and provides the 'W' (mono) component of the B-Format signal. Then four groups are fed into the unit. Selecting a pair of these groups (one odd, one even, as is standard practice) and panning between them allows panning across one quadrant (90 degrees) of the 360 degree Ambisonic soundstage. This unit is generally used in combination with the other two. Whatever mixing method you use, experience indicates that if pan positions are determined while listening in surround, you can then return to stereo monitoring and concentrate on that for the rest of the mix: the surround will take care of itself. In fact, in general, it is advisable to create the final balance while monitoring with the most basic configuration the material is likely to be heard on. In other words, if most of your listeners will hear the material in mono, monitor in mono as you do your final balance. If most people will hear it in stereo, monitor in stereo. The resulting surround balance will be fine. Any Ambisonic recording is an 'enhanced stereo' recording. As the standard information panel on many Ambisonic records says, "This UHJ/Ambisonic recording will reproduce full surround sound when replayed through an Ambisonic decoder; however, enhanced stereo and improved mono/stereo compatibility will be experienced when replayed through normal audio equipment." Ambisonics was designed originally as an encode/decode system, in the same way as Dolby, and it is undeniable that Ambisonic recordings are best experienced via a decoder with a multi-speaker system. A typical stereo listening setup would be expected to have speakers at 60 degrees for the front stage, and in its simplest form an Ambisonic decoder just adds two speakers to the rear in the same configuration. When decoded, a horizontal surround Ambisonic system can be used to localise a source anywhere within a circle. Every position in the circle is represented by a unique combination of phase and level, once again. In fact, in Ambisonics, the phase/level combinations have been psychoacoustically set up to closely emulate the relationships actually experienced in our hearing. When the decoder is bypassed (or missing), the rear signals are 'folded over' to the front speakers This means that something at the far left or right edges of the circle will actually fall outside the speakers in stereo, when the decoder is switched out and only the standard stereo speakers are used. Signals in the rear soundstage additionally have a more distant quality--when undecoded their level is reduced slightly to enhance this effect--and generally appear behind the listener due to 'aural decoding' (the brain attempts to localise the sound source correctly, based on the phase and level information). Ambisonics can therefore rightly be considered as a 'stereo spatial enhancement system'. In fact, the results of listening to 'undecoded' Ambisonic mixes are very impressive. Mono compatibility is excellent and there are no 'forbidden positions' which don't work in mono. The spatial effects experienced with nondecoded Ambisonics are at least as impressive as those achieved with some of the systems currently in vogue, but they are more stable and are very independent of listener position--you can get the effect almost anywhere in the room. There is little or no sound change caused by different spatial positions and there is no appreciable 'phasiness'. The reproduction of spatial positions is very accurate up to about 180 degrees--beyond that strong positions are heard, but they are not as accurate as when the signal is decoded. However, the undecoded results are highly satisfactory and rival those of other systems--but without the expense or the shortcomings. The mono/stereo compatibility of Ambisonics means that a recording can be made which at the same time offers mono listeners an exceptionally accurate balance; stereo listeners a stereo that is much wider and more stable than conventional panpotted-mono, and is less dependent on listener position; while listeners with a decoder can experience a uniquely accurate full surround sound. In a world in which few people currently have decoders, this 'future-proof' aspect of an Ambisonic recording, offering full compatibility with existing systems, impressive stereo enhancement effects, and with the ability for those same recordings to be decoded at a later date into full surround, is very important. Simple stereo enhancement can be carried out by processing existing mixes through a Transcoder. This technique is used by several AM stereo radio stations in the USA to make their stereo signal sound more impressive. Simply feed the stereo signal into the front stage inputs of the Transcoder and set the front stage width to maximum. The UHJ output can be treated as stereo. You can try adding reverberation, with the reverb returns being brought back to the rear stage inputs. However, it is generally much more impressive to use the Transcoder as described for basic Ambisonic mixing, feeding groups into the unit and mixing with it rather than processing the balance afterwards. In this case you are actually creating an Ambisonic recording, and if it isn't too much trouble, it's worth listening to it via a decoder and four speakers from time to time. Two-channel UHJ Ambisonic recordings actually offer better mono compatibility than panpotted mono recordings. But there are other benefits, too. Particularly noticeable is the fact that Ambisonic recordings are very robust. Because every position in the soundfield has a unique combination of phase and level, the effect of azimuth errors is minimised. This is particularly useful in environments where unstable stereo sources are summed into mono very frequently--NAB cartridges still used by many radio stations being an excellent example. The azimuth on these machines can wander dramatically during playback, giving a watery, phasey sound for mono listeners. An Ambisonic recording, however, will not suffer so much under the same conditions. The phasing effect is caused by major parts of the stereo signal cancelling as they move past each other in mono, because of variations in azimuth. However, as the parts of an Ambisonic signal have different phase relationships, individual elements cancel at different times under the same conditions. The result, instead of a phasey effect, is of a subtle change of balance over time. This is seldom noticeable.